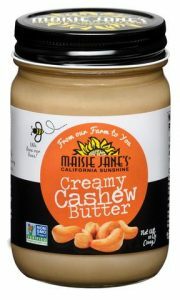 Maisie Jane’s Cashew Butter is a Winner! We’re so excited! Our Maisie Jane’s Creamy Cashew Butter has been declared a taste test winner by Good Housekeeping magazine! The results were published in the February 2019 on page 51! Well then, this is the perfect time to talk about what’s great about cashew butter. Years ago—long before I ever tasted any nut butter besides peanut—a very good friend showed me how to make a delicious vegan cashew soup using cashews ground in a blender until smooth. Flavored with tamari and mixed with any vegetables I wanted, it became a staple dinner in my house for years to come. My friends and I loved it because it was a great substitute for dairy and an excellent source of nutrition. But, mostly, we just loved eating that soup! Fast forward more years than I like to count and now we’re making cashew butter at Maisie Jane’s. And it contains exactly the same ingredients—ONE ingredient—100% dry roasted cashews. No sugar, no palm oil, no added oil or additives of any sort. Just wholesome and delicious pure nuts! It’s GMO Project Verified, Kosher certified, gluten free, wheat free, and made in our plant that does NOT process peanuts. Cashew butter is also really good for you. I first tried it because it’s a great source of protein—5.6 grams per serving. But it also contains more iron, copper and phosphorus than peanut butter. And all the fat in it is heart-healthy unsaturated fat. That means it can give you the satisfaction you need without the damaging saturated fats you might find in other protein-laden foods. At Maisie Jane’s we have three cashew butters to choose from: the Creamy Cashew Butter featured in the Good Housekeeping article, our Organic Creamy Cashew Butter, and our insanely delicious Organic Sea Salt Caramel Cashew Butter. Lots of choices to fuel your next culinary adventures!